Sakae is one of the most popular areas of the city for shopping and can be considered the most central area of the city of Nagoya. The center of the district of Sakae is a very narrow but long (2 km) park from north to south, known as Hisaya Ōdori Koen. This park is divided in several "squares" in each of which there are positioned various sculptures and art installations. In particular, there are four squares dedicated to the four sister cities of Nagoya, Los Angeles, Mexico City, Nanjing and Sidney (Turin is a sister city too, but nothing is dedicated to it). On weekends the whole park is filled with performing street artists. At the center the park there is finally one of the most famous buildings of the city, the Nagoya TV Tower. This telecommunications tower is a landmark for the city of Nagoya, it was in fact completed in 1954 and was the first tower of its kind in Japan. Its designer, Tachū Naitō, a few years later would have built other similar towers including the famous Tokyo Tower, and this tower, with a very similar architecture reminding the Eiffel Tower in Paris, can be considered the forerunner of all the others.Moreover, in 1992 this tower was destroyed by a giant monster, in the film Godzilla vs. Mothra, set in Nagoya. The office is located on the third floor of the building, from where you can take the elevator to the first observation deck, 90 meters high. From there you can go up to the Sky Balcony, a 100 meters high open-air observatory, without glasses. On Saturday and Sunday, between 10 to 16, as an alternative to the elevator, the sky walk is open too, a long staircase that allows you to walk up to the top (for a total of 310 steps). Furthermore, a sort of "underground city" is located below the whole area, full of shops, boutiques, restaurants, bakeries and cafes of all kinds. Last but not least, in this area there are two other shopping complexes that deserve a dedicated paragraph, the Oasis 21 and the Sunshine Sakae. 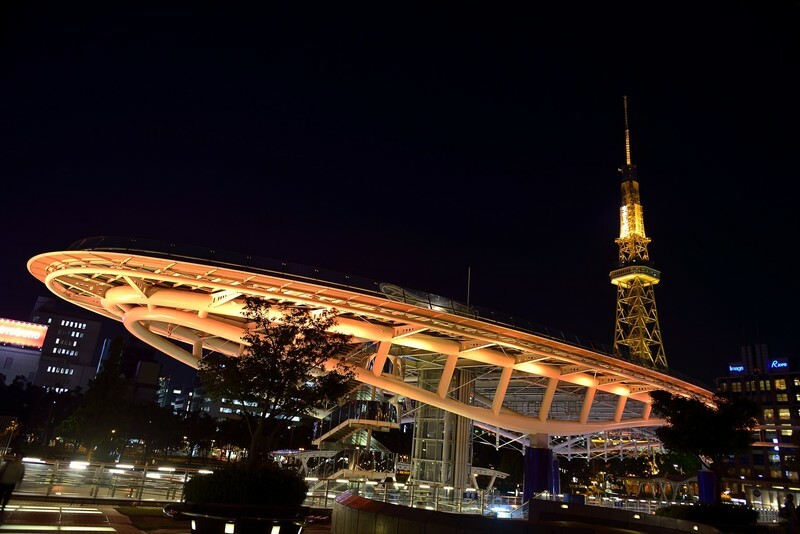 Located almost in front of the TV Tower, west of Hisaya Odori Park, Oasis 21 is a futuristic architecture building opened in 2002. It is famous for its particular roof, a construction of glass and steel (on which you can go up for a walk), and in which there are pools of water that are visible both from above and below because of the transparency of the structure. The entire building should represent a spaceship. Inside is a bus terminal and many shops and restaurants, it's a very popular place to meet. 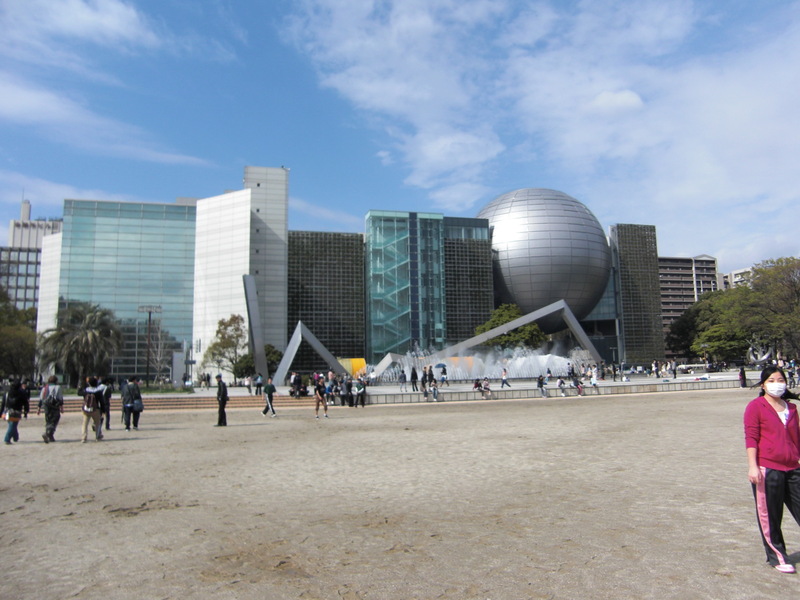 A shopping complex located 200 meters east of the Hisaya Odori Park. 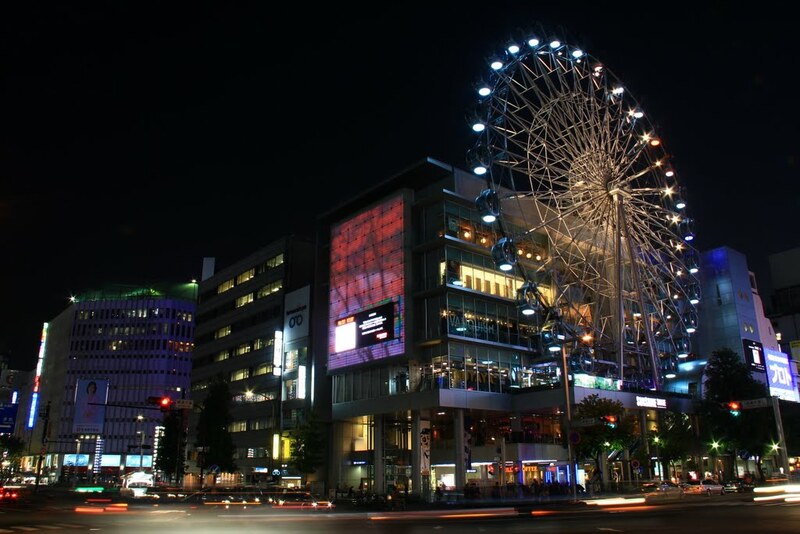 A 52-meter high Ferris wheel is also part of the complex, it can be accessed from the 3rd floor (500 yen, 11-23). On the 2nd floor there is the theater where every weekend performs the idol group known as SKE48, Nagoya's version of the much more famous AKB48 of Tokyo. On the 5th floor there are also a shop and a cafe dedicated to SKE48. About 1 km southwest of Sakae station is a park (Shirakawa Koen, inside which you can find two important museums of the city, the Nagoya City Art Museum and the Nagoya City Science Museum. Located in the southeast corner of the Shirakawa Park, this museum (3 floors) has a small permanent collection including works of the "School of Paris", works of the "Mexican Muralism" and various works of contemporary Japanese art and local artists. During the year there are also special exhibitions with separate admission. 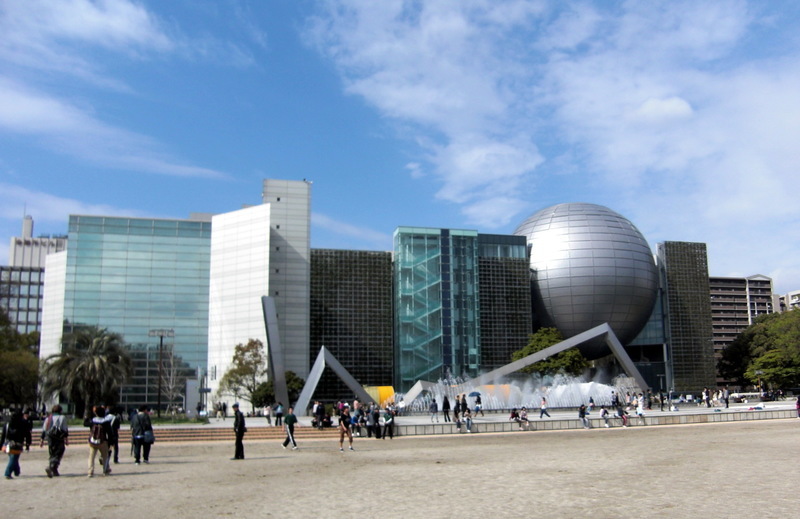 This museum, located in the north of Shirakawa Park, consists of a large 7-storey building among which stands a giant metal sphere housing the world's largest planetarium (the entrance to the planetarium costs 400 yen extra, the shows are only in Japanese). As for the museum, it is a typical science museum like many others in the world, with many interactive experiences (for example, you can try the climatic conditions of the South Pole in a room with a temperature of -32°C) and several curious and interesting things, in part aimed primarily at children and teenagers. Very few descriptions in English but sometimes they're not necessary. 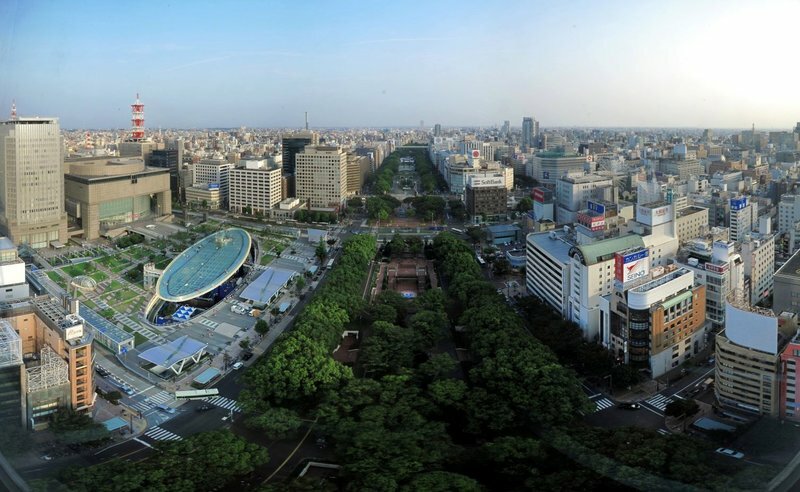 The area of Sakae is the main shopping district of the city, it is located a few kilometers away from Nagoya station, and it is for these reasons a great area to stay during your stay in Nagoya. This area is full of business hotels belonging to the most popular hotel chains in Japan: the Nagoya Sakae Washington Hotel Plaza, the R&B Hotel Nagoya Sakae Higashi, the Best Western Hotel Nagoya, the Nagoya Sakae Tokyu Inn, the APA Hotel Nagoya Sakae, the Trusty Nagoya Sakae Hotel. Among all the business hotels in the area, one of the best as for value for money is the Unizo Inn Nagoya Sakae, both for its location (just 100 meters from Sakae station and the Sakae Oasis 21), and for the high level of cleanliness and modernity of the building, opened in 2014. Single rooms from 7000 yen, doubles from 8,000 yen. 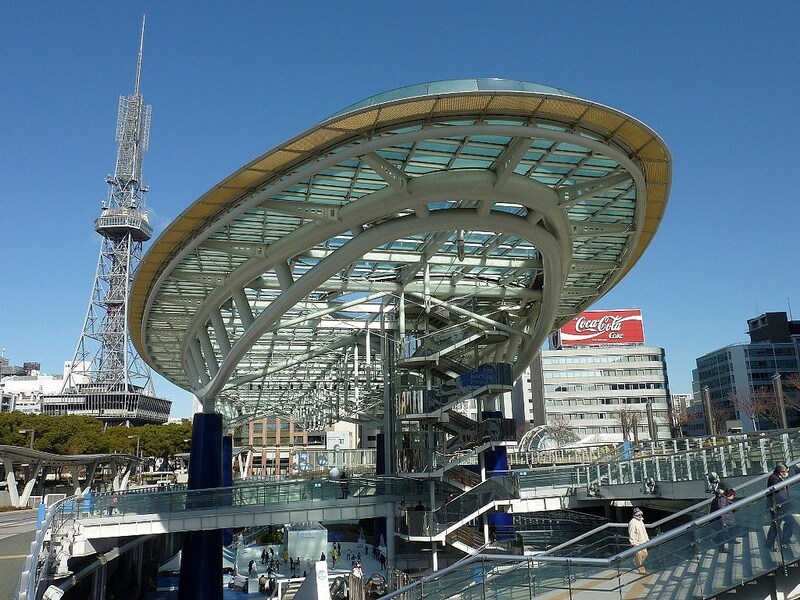 Sakae station is a subway station served by the Higashiyama line and Meijo line. Just to the north is another metro station, Hisaya-ōdōri, served by the Sakura-dōri line and Meijo line. This area is therefore served by three metro lines, through which you can reach in a few minutes and without changes most of the other interesting areas of the city (5 minutes to Nagoya station, 6 minutes to Kanayama, 6 minutes to the Castle, 13 minutes to Higashiyama park), and this makes this area the perfect one to stay in Nagoya. Alternatively you can move on foot, both to Nagoya station (2.5 km west) and the castle (1.5 km north), but also to the area of Osu (1,5 km south).